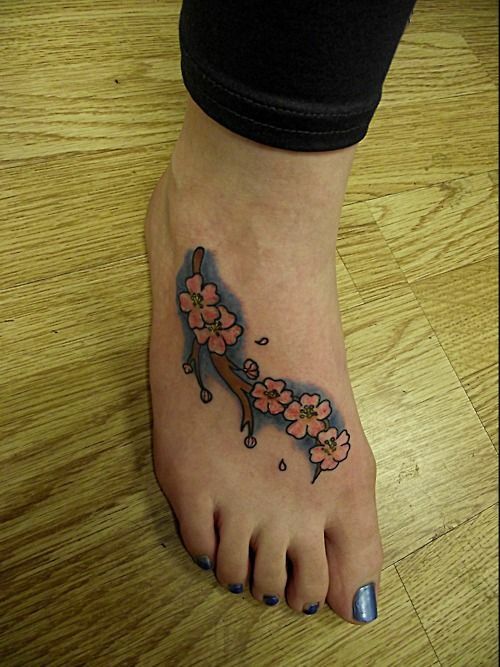 Little cherry blossom branch and pink flowers and petals inked on the top of her foot with a blue background. Here is a nice foot tattoo of a branch and cherry blossom flowers. The branch curves from the ankle toward the toes and is filled in solid brown. Cherry blossom flowers have a simple design but colors and shading make them look so pretty. These flowers have light and dark pink with yellow and black centers. She has a dark blue background, which makes the light colors of the cherry blossoms pop against it. She also did little pink single petals and buds without blue behind them. Some people add names or other symbols to cherry blossom tattoos because they have strong meanings and are symbols of beauty in various cultures.